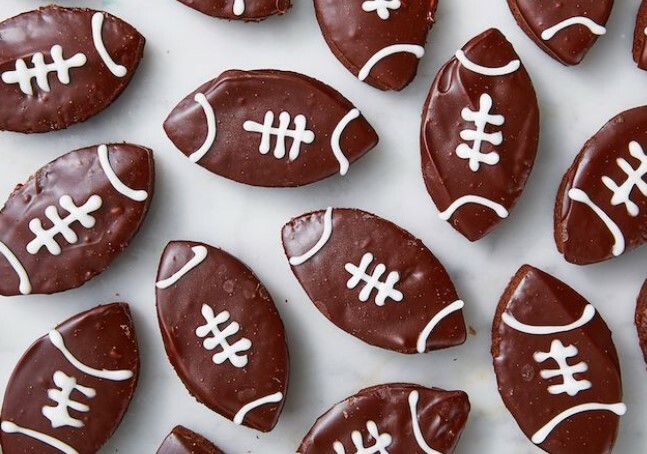 Football-shaped foods are a Game Day party must. You can keep things simple with a boxed mix for this recipe. Preheat oven to 350° and line a 9″-x-13″ pan with parchment paper. Prepare brownie mix according to instructions and bake until a toothpick inserted in the center comes out clean, 20 to 23 minutes. Let cool completely. Cut football shaped brownies out of baked brownies and place on a cooling rack placed over a baking sheet. Place semisweet chocolate chips in a heat proof bowl and microwave cream until hot, about 40 seconds. Pour cream over chocolate and let sit 3 minutes, then stir until creamy and no lumps remain. Add Baileys and stir until smooth. Dip brownies in ganache and place in the refrigerator to set, 30 minutes. Making icing: In a small bowl, stir powdered sugar and milk until thoroughly combined. Place icing into a piping bag or resealable plastic bag and cut a very small hole in the tip. Decorate each football with laces, then return tray to the refrigerator to harden, 5 minutes more.